The passing of a loved one is hard enough, but when you imagine the untold stories that pass with them, it can become even more heart wrenching. These stories don’t have to fade. Mike O’Krent has spent his career capturing these stories. As a speaker, he teaches audiences how to do the same. Mike O’Krent is the founder of LifeStories Alive, LLC. The company specializes in making personal history videos for families that value their heritage. 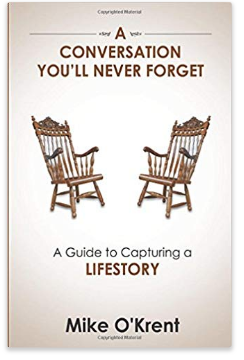 They create family heirlooms in video format – digitally mastered records of life stories with personal accounts, photos and mementos of family history. He was born and raised in San Antonio, Texas and graduated from Southern Methodist University with a BBA in Marketing and Management. He entered my family’s retail floor covering business as the 4th generation to be part of that business. Between 1996 and 2000 he interviewed Holocaust survivors for Steven Spielberg’s Survivors of the Shoah Visual History Foundation. During that incredible experience, he discovered the process and the importance of recording the life stories of our loved ones. He moved to Austin in 1998 when he bought and managed a local floor covering business; which he then sold in 2004. He founded LifeStories Alive at the end of 2005.